Home / 1950s / Forget Snakes on a Plane, how about the MGM Lion? Forget Snakes on a Plane, how about the MGM Lion? To give you some background information there have actually been 7 different MGM Lions. Two lions called ‘Telly’ and ‘Coffee’ were used for the first colour tests between 1927 and 1934. George the lion was only used for a year between 1956 and 1957, possibly because he looks more like he’s yawning than roaring. Not the greatest start to a movie! And the current lion is the lovely short-maned Leo, who has been the face (and roar) of MGM since 1957. The doomed flight was between San Diego and New York. The aircraft company B.F. Mahoney Aircraft Corporation modified a plane to include a cage for Leo (who was probably actually Jackie even though they called him ‘Leo’ for the publicity stunt) and the pilot set off to much media fanfare. A few hours later the plane crashed in Arizona. The pilot gave the lion milk, water and shared his sandwiches with him (nice man) and then set off on foot to get help. It took him 4 days in the wilderness before he stumbled upon some cowboys who helped him find a telephone. When he called MGM their first question was ‘How’s the Lion?’ (and quite rightly too!). Apparently the cowboys thought about holding the lion for ransom, but decided against it when they actually saw him in real life! 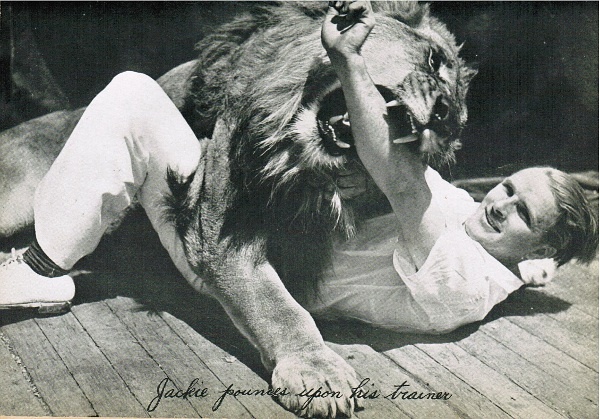 Oh, and if you haven’t had enough of lions just yet check out this photo of the same lion Jackie ‘playing with his trainer’! Yikes! Who’d be a lion trainer eh?